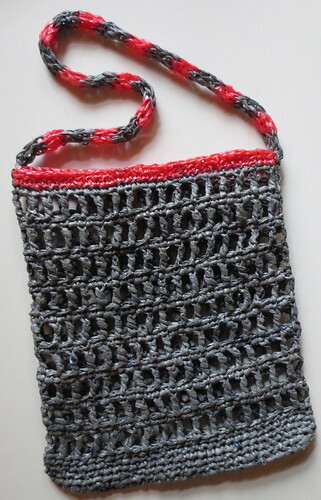 I shared in a recent post about weaving the strap handle for this recycled tote bag. I made the strap using a spool knitter and variegated the plastic bag strips with grey and pink loops to form the woven strap. Then I crocheted the body of the bag using an open netting type stitch for the project. Here is the completed recycled tote bag. Here is a closeup of the strap and top edge of the bag. 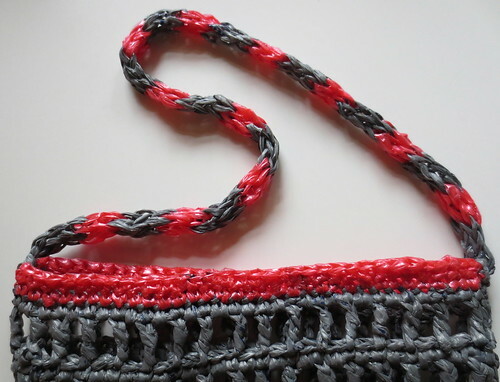 Below you will find the complete pattern to crochet the recycled tote bag. I hope you enjoy the pattern and don’t hesitate to contact me should you have any questions as you work this pattern or any of my other free patterns. All crochet directions are in US terms.